Shopping for a bike for your favorite little girl? You’re in luck! We’ve researched and tested dozens of 20-inch girls bikes to find the best one for your child (or grandchild). Here’s a list of our five favorites, as well as a comparison chart, and some things to think about when shopping for a girls bike. We’ve also suggested some “bling”, things you can do to add a little extra pizzaz or girliness to these bikes — baskets, streamers, and more. Before we get started, it’s important to clarify: there is no such thing as a “girls” bike. Kids bikes are non-gender specific. That means any 20-inch bike is potentially a good bike for your child. That said, there are a few things that make a bike a good bike for a girl. The first, and most obvious, is that it’s feminine. We’ve tried to pick bikes that most girls would think look pretty. The second is that it should be lightweight and easy to handle. Girls, in general, tend to be less muscular and timider that little boys, which makes it particularly important that their bicycles be light and stable. 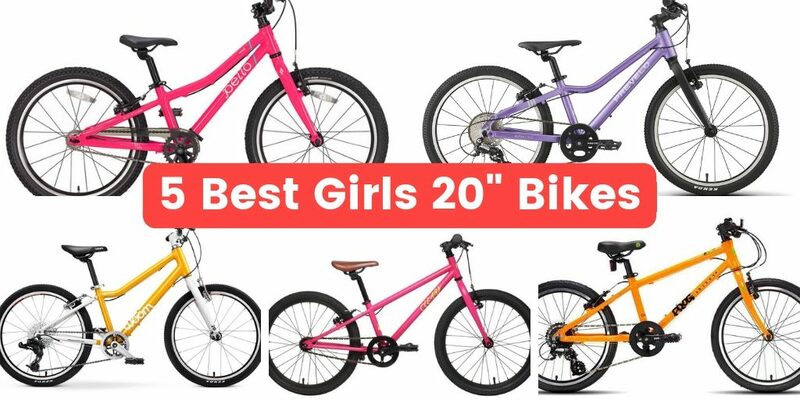 The bikes we’ve listed below are just what we’ve promised: THE BEST girls’ 20 inch bikes. And remember, like all things in life, the best of something comes with a price tag. Higher-quality bikes are lighter, and weight is everything when it comes to your child enjoying their bike. Higher-quality bikes are more durable. These bikes will last for YEARS and then can still be handed down or sold. They aren’t going to end up breaking down and being tossed in a landfill. Higher-quality bikes have been intelligently designed. Each of the companies below have spent tons of money and time on research and development and engineering. These bikes are easier to ride and easier and safer to handle. That said, if you simply can’t afford one of these bikes, don’t despair! We’ve put together a list on how to find a great used bike. You don’t necessarily have to buy a new bike to get a good bike. Woom makes our favorite kids bikes, hands down. The Woom 4, their 20 inch offering, weighs in at a mere 16 pounds. Combined with the upright and forgiving geometry, this makes it the ideal bike for petite girls. It comes in a variety of pretty colors and can be accessorized with all kinds of matching gear. 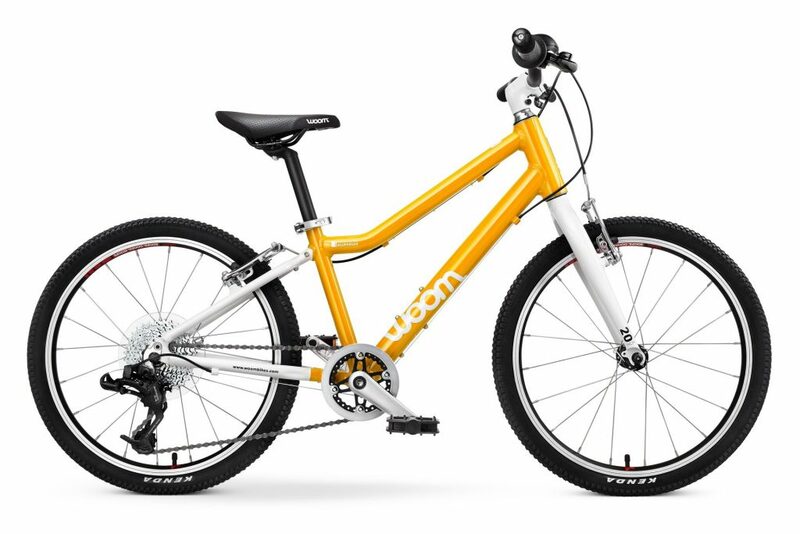 Woom also offers a trade-up program, so when your child is ready to move to a 24 inch bike, you can save some money. For more information on the Woom 4, read our detailed review. Pretty in purple, the Prevelo Alpha Three not only looks good, it’s also fast. This is a high-quality bike with durable components and intelligent design. minimum seat height and low standover height, allowing it to fit smaller or younger kids. For more information, read our review of the Prevelo Alpha Three. There’s a lot to love about the Frog 55. This little ride is fast, light, and oh so pretty. Both the frame and componenets on the Frog 55 are super high-quality which means the bike will last for years, can be handed down to younger siblings, or sold for good resale value on Craiglist. It comes with fenders which are fun, and can be helpful if you live in a rainy climate. Pello, one of our favorite kids bike brands, offers two different 20 inch bikes that both deserve to be on this list. The Pello Reddi is better for younger riders (ages 5+). 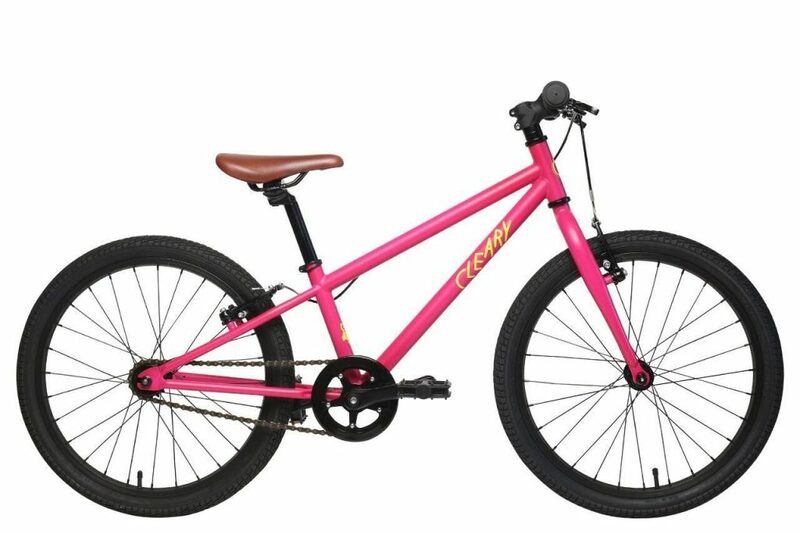 It has a low standover height and the simplicity of a singlespeed drivetrain, so your little one doesn’t need to worry about shifting gears. The Pello Rover is the better option for slightly older and more athletic riders (ages 6+) and has a 7-speed drivetrain with easy-to-shift gears. 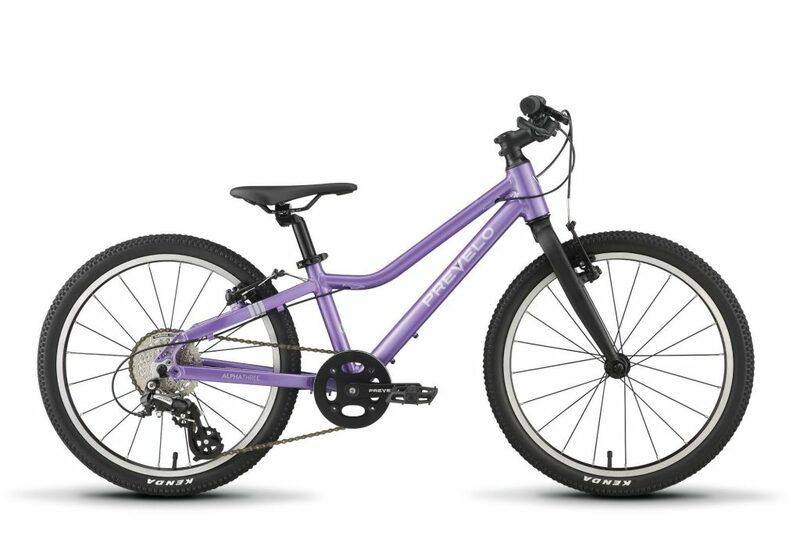 Thanks to the disc brakes and beefy tires, this is our top pick for girls who may want to do a little off-pavement riding. For more information, read our detailed review of the Pello Reddi. If your jaw didn’t automatically drop when you saw this bike–what’s wrong with you?!?! Just kidding (kind of). The Cleary Owl is unique amongst the other 20 inch bikes listed here in that it has a steel frame. Isn’t steel heavy, you ask? Not necessarily. The Cleary Owl actually manages to be light weight, but has the added durablity and longevity of heavy-duty steel construction. Of course, the steel is covered up with beautiful powder-coating, and the bike looks REALLY nice. We also like the faux leather saddle, and the high-quality parts. The bike comes in both a single-speed version and a 3-speed internally geared hub. This makes it the ideal bike for kids who aren’t ready for the complexity of shifting gears. Want even more options than the bikes listed above? Check out our list of the best 20 inch kids bikes. No these aren’t all “girls” bikes, but they are great bikes for kids and you can always add some girly accessories if needed. Not sure how these bikes stack up? Here’s a comparison chart to help you choose. But What About the Bling?!?! A lot of times when parents or grandparents ask me about a “girls bike” what they are really looking for is a bike with steamers and a basket. Unfortunately, most bikes that come with streamers and a basket are cheap and have sub-par quality and durability. But that’s okay, because it’s easy to add a little bling to the bike. Here are some of our favorite after-market accessories. We’ve mentioned this a few times already, but weight is everything when shopping for a kids bike. Girls, in particular, tend to be more petite, more timid, and less muscular than boys at this age. They benefit so much when put on a lighter weight bike. Bikes that you get at a big box store can easily weigh 40 or 50 percent (or more!!!!) of your child’s bodyweight. For a 20 inch bicycle, you should aim to stay at around 20 pounds or ideally less. The flipside to weight is durability. You don’t want a bike that doesn’t weigh very much but that’s going to break or fall apart a month down the road. That’s why we recommend buying a high-quality bike that isn’t going to end up in the landfill. Not only is that bad for your wallet, it’s bad for the environment as well. 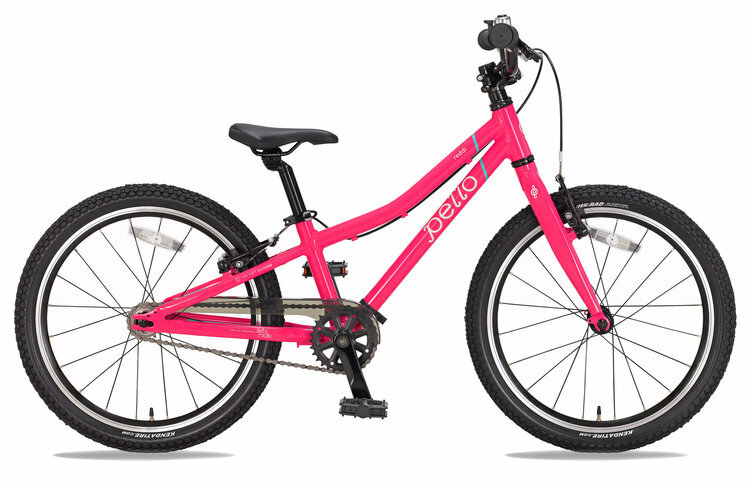 A 20 inch bike is generally appropriate for girls ages 6 to 8. There are a few bikes on this list (the Pello Reddi and the Prevelo Alpha Three) that might work for girls as young as 5. A better indicator than age is your child’s size. Measure both your child’s height and inseam (in inches). The minimum seatpost height of the bike you are considering should be no more than 2 inches taller than your child’s inseam. The other important thing to consider is the geometry of the bike. More upright bikes (like the Woom 4 and Pello Reddi) are better for girls just learning to ride or who are timid. Bikes with more leaned-over and agressive geometry (like the Prevelo Alpha Three and Cleary Owl) are better for girls who like to ride fast and do tricks. One thing that you’ll notice is that all the bikes on this list have dual handbrakes and a freehub. They do NOT have a coaster brake like many cheaper kids bikes. (A coaster brake is probably what you had on YOUR bike growing up. It’s where you pedal backward and the bike stops). They make pedaling easier. Lots of kids get confused when they pedal backward and suddenly jolt to a stop. 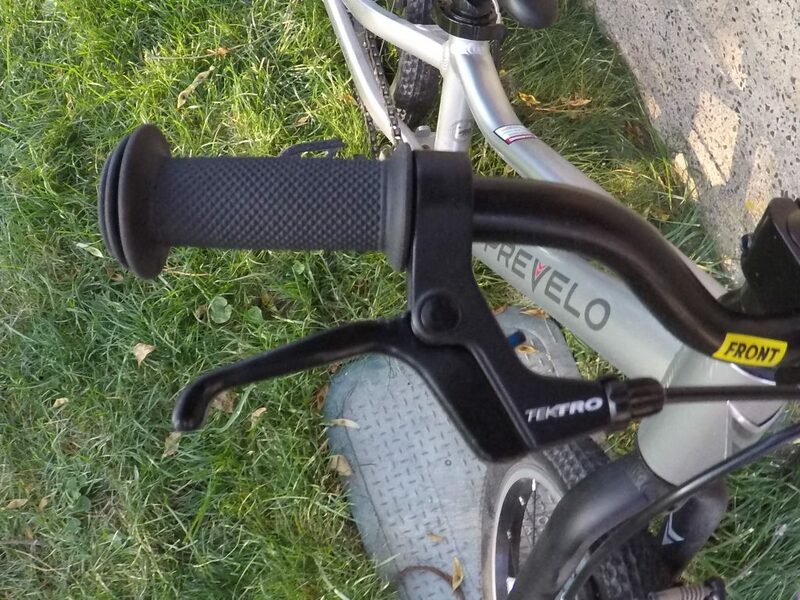 The other thing you want to consider when looking at brakes on a kids bike is how easy are the brake levers to operate. They should be easy for small hands to reach and easy for small hands to pull. All the bikes on this list fit that criteria, but many kids bikes on the market do not. A 20 inch bike is the first time your child (or grandchild) will have the option to have gears. This is an exciting step, but not appropriate for everyone. Gears are awesome in that they allow kids to climb bigger hills and ride faster. If your child has already mastered pedaling and is ready for the next step, definitely pick a bike with a few gears. 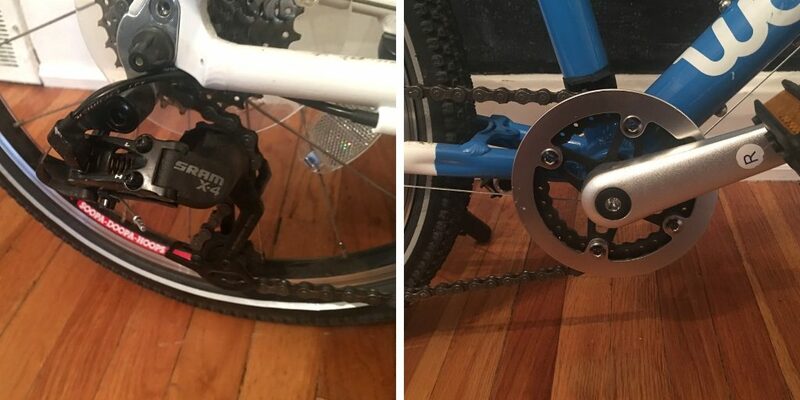 The drivetrain on the Woom 4. Good quality components and easy-to-operate shifters make learning to use gears easy. That said, there are some situations where your child is better of staying on a singlespeed bike. If they are still learning to pedal, adding gears can add complication that they don’t need. Additionally, gears add two things not everyone wants: weight and cost. If you’re on a tight budget, a singlespeed bike is going to be cheaper. This is one area where you can scrimp without seriously affecting the quality of the bike or your child’s enjoyment. Additionally, if your child is particularly petite a singlespeed is generally (though not always) lighter than a bike with gears. You’ll notice that none of the bikes on this list have training wheels. Why? Because your child doesn’t need them! Training wheels can actually hinder your child’s ability to learn to ride a bike. They are also the source of a lot of frustration for many children. So what do you do if your child hasn’t already learned to ride a bike? Simple. Lower the seat on their bike all the way and take the pedals off. Have the kiddo practice scooting a gliding on the bike as they would on a balance bike. Once they’ve learned to balance on the bike, you can try adding the pedals back on. Are you the type that likes to do plenty of research? Me too.